It is the year 2000 - and full employment, material abundance and social harmony can be found everywhere. This is the America to which Julian West, a young Bostonian, awakens after more than a century of sleep. 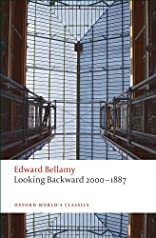 West's initial sense of wonder, his gradual acceptance of the new order and a new love, and Bellamy's wonderful prophetic inventions - electric lighting, shopping malls, credit cards, electronic broadcasting - ensured the mass popularity of this 1888 novel. But, however rich in fantasy and romance, "Looking Backward" is a passionate attach on the social ills of nineteenth-century industrialism and a plea for social reform and moral renewal. In her introduction, Cecelia Tichi discusses how the novel echoes the anguish and hopes of its own age while it embodies a sustaining myth of the American literary tradition - that man's perfectibility is attainable in the New World.